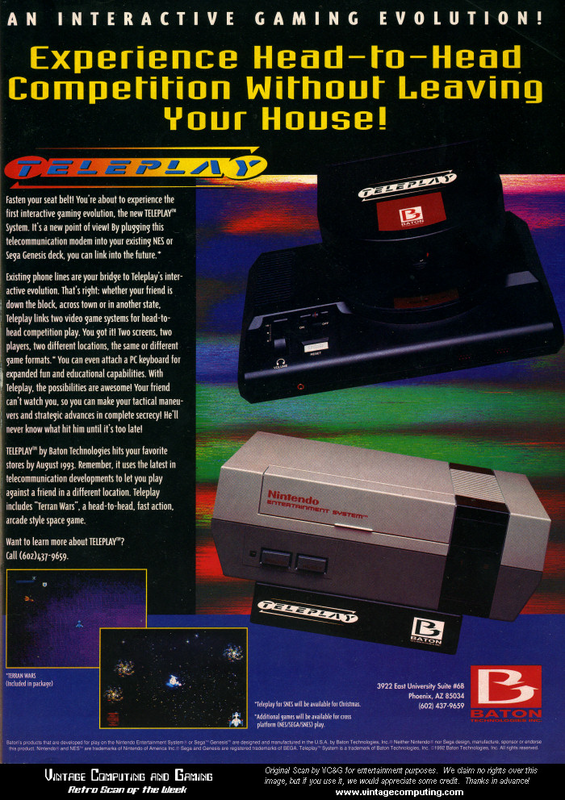 The Nintendo Entertainment System had many official peripherals and hundreds of 3rd party products released for it. Here is a list of some of the well known 3rd party accessories for the NES and the Famicom. 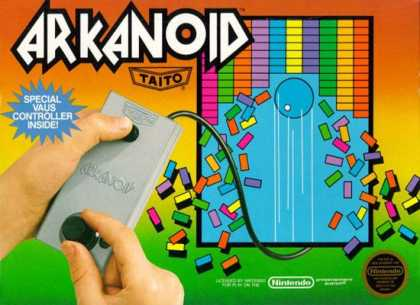 The Arkanoid Controller, marketed as the Vaus controller by developers Taito, was a free controller which game bundled with the game Arkanoid. It featured one button at the top of the controller and a spinning paddle at the bottom. The Epyx 500XJ was a popular controller which was released in the late 80s. The controller had a good joystick at the top and fire buttons at the bottom where the fingers rested. 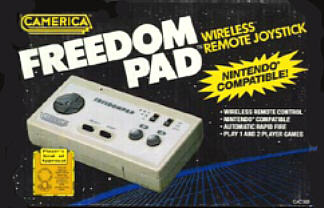 The Freedom Pad was an infrared controller which was produced by Camerica. 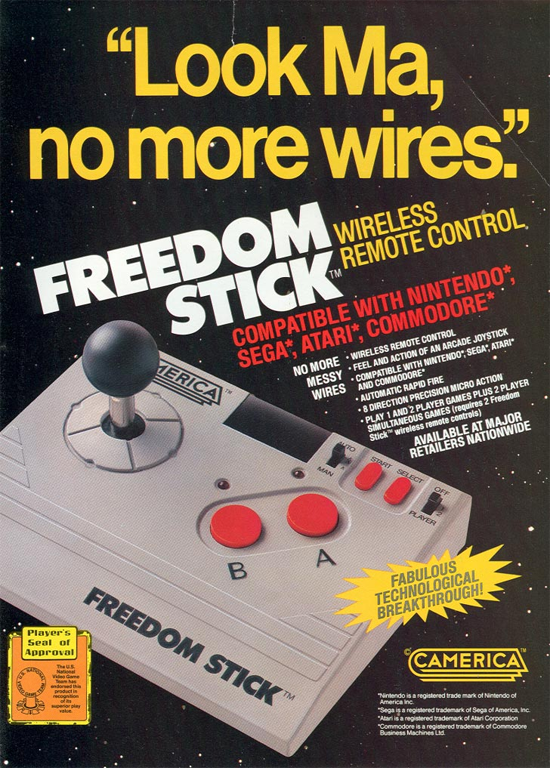 Also produced by Camerica, the Freedom Stick was essentially a NES Advantage rip off. Nintendo took Camerica to court because of it and won. 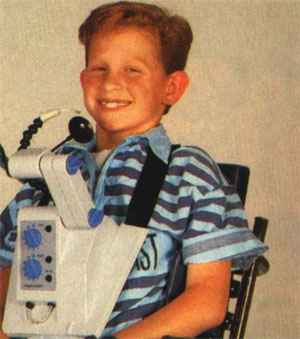 Selling for a whopping $179 in 1989, the Hands Free Controller was a disabled friendly controller which was created for people with serious physical conditions. 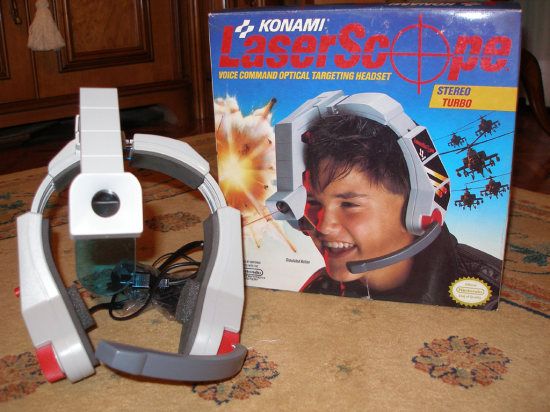 Originally released in Japan in 1990, the LaserScope was a Konami produced head set which included a light gun and a microphone. Laser Invasion was the only game which was released for the device. In order to shoot users had to shout ‘fire!’ when playing the game. The device did play all light gun compatible games though. Released in 1987 by Bandai, the Mega controller was so amazing, they had to plaster MEGA across the face of the controller! 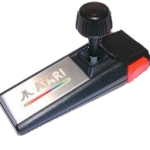 The controller was programmable and allowed you to set buttons to turbo, slow motion etc. A puzzle game could also be played on the LCD screen. 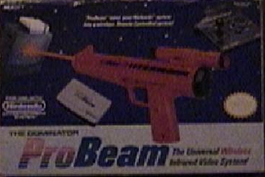 Released by Dominator, the Pro Beam was a 3rd party light gun for the NES. 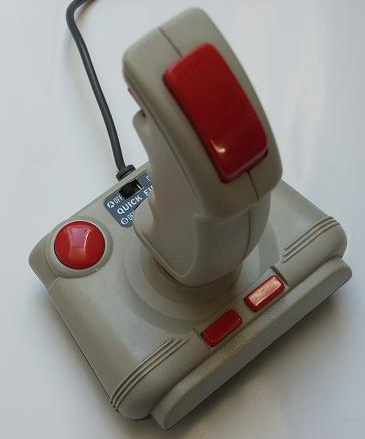 Designed specifically for flying and simulation games, the Quickshot Aviator boasted an altitude level indicator in the centre and turbo buttons too. One of the strangest looking controllers ever made, the controller resembled the grip from a motorbike. It had a D-Pad and a button on the front and another button on the back. I don’t imagine it would have been easy to play games with this device though. 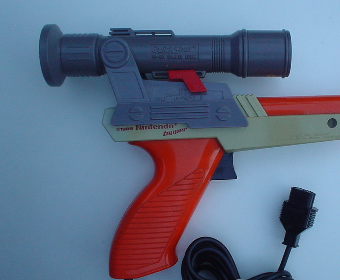 The Quickshot Sighting Scope was an attachment which fit directly on top of the official NES Zapper. 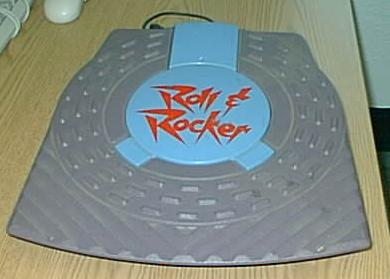 The Roll ‘n Rocker was a strange plastic peripheral which had a ball underneath it. It let the user control their character by standing on it and tilting from side to side. Why anyone would buy this is beyond me! 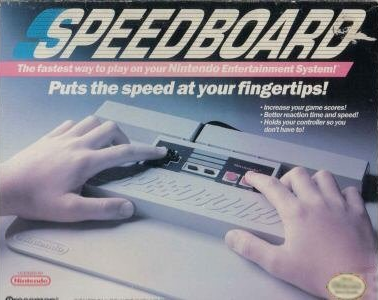 Another accessory which was completely pointless was the Speedboard. This was basically a large piece of plastic which held the official NES controller, which allowed the user to rapidly push the buttons. 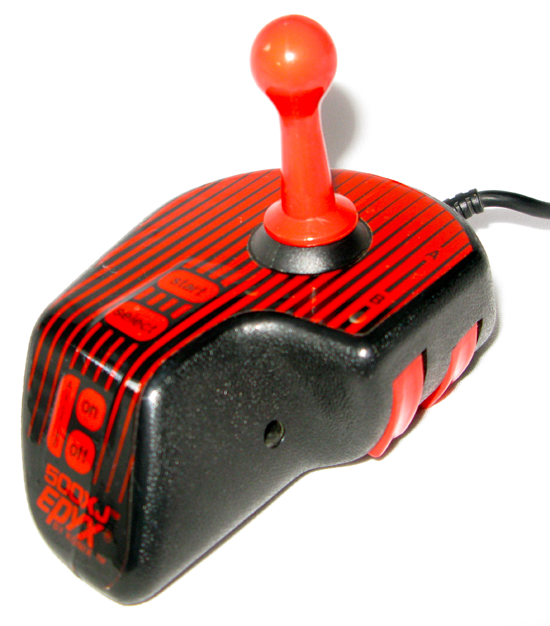 A 3rd party controller from Konix which was identical to the Epyx 500XJ. 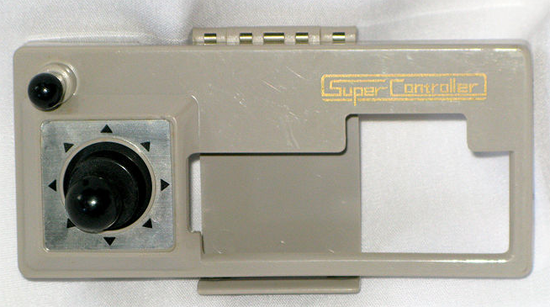 Released by Bandai, the Super Controller was an accessory which worked in conjunction with the official NES controller. 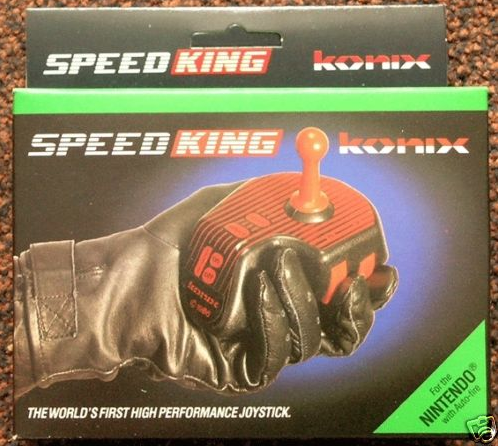 All you had to do was place the Super Controller over your original one; this replaced the D-Pad with a joystick. 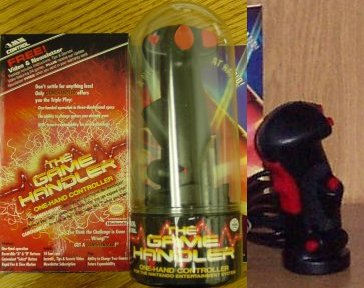 The Game Handler was a strange controller which allowed the user to play the NES using one hand. It featured turbo buttons, slow motion and also let you do certain things in games like make Mario run backwards. 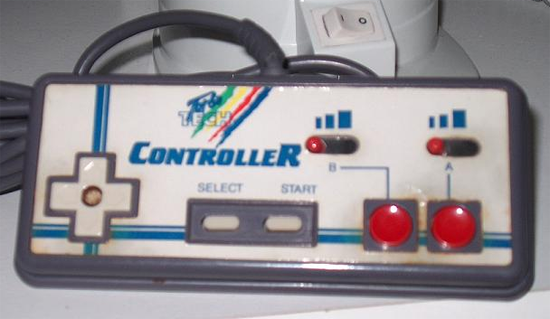 A colourful yet crude looking controller which featured turbo switches for both buttons. 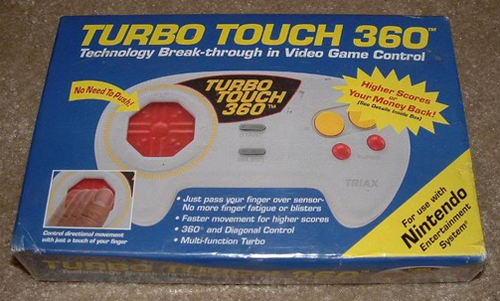 The Turbo Touch 360 was an interesting joypad whose main selling point was it’s 360 degrees D-Pad. It promised ‘Mo More Finger Fatigue or Blisters’. 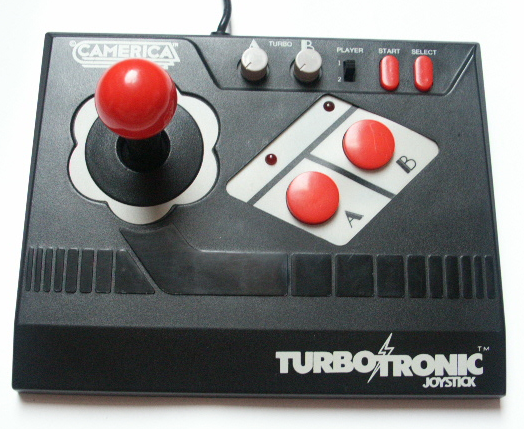 The controller also had turbo buttons. 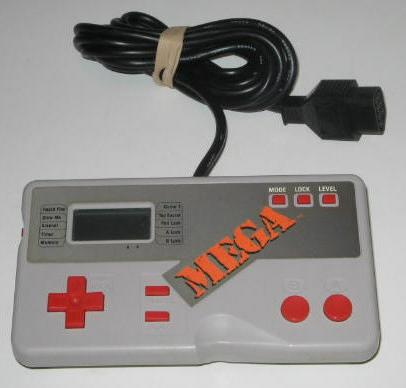 Another NES Advantage Clone from Camerica, Nintendo took them to court over this controller and won. Produced by Brøderbund in the late 80s, U-Force was a strange device which allowed users to play games by simply moving their hands above the infrared sensors. 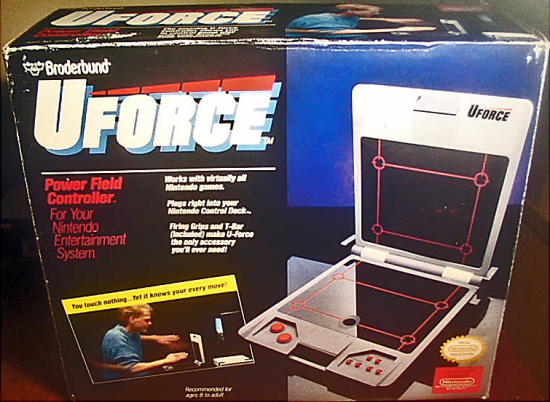 It came packaged with a flight stick attachment which didn’t even attach to the U-Force unit. 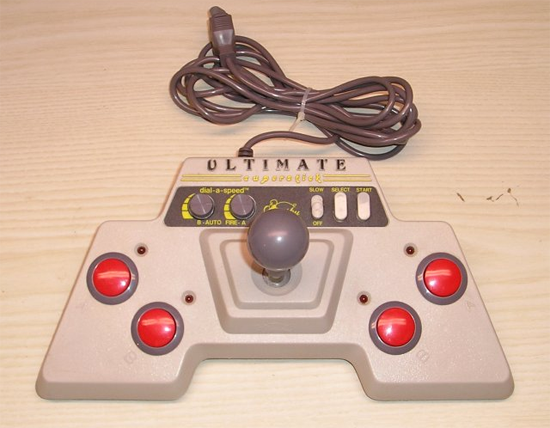 Produced by Beeshu, the Ultimate Superstick is a rare arcade controller which was released in Japan. It has suckers to stick to a table, turbo buttons and slow motion buttons. It also has large A and B buttons on both sides of the joystick, making it the perfect controller for left and right handed gamers. A good joystick from Beeshu which featured a quick fire switch at the front. 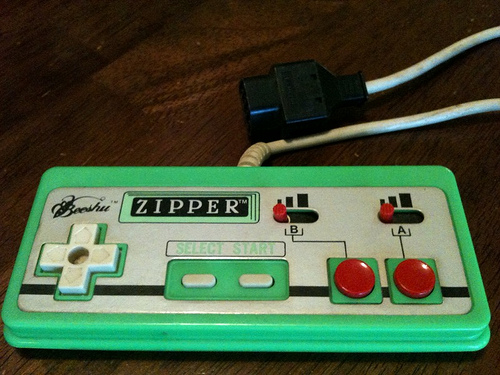 Produced by Beeshu, the Zipper was a turbo joypad which was identical to the Turbo Tech Controller. 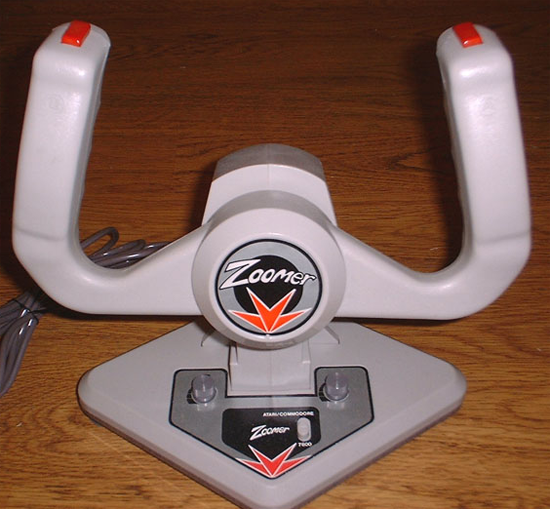 Another Beeshu controller, the Zoomer was a flight simulator joystick which had buttons at the top of the handles. 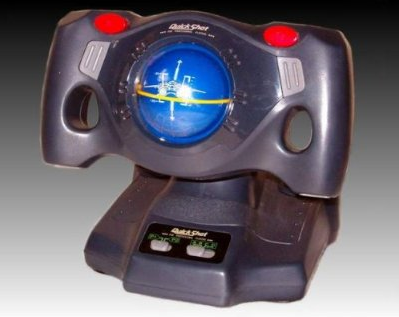 The Datach Joint ROM System was an add on which was produced by Bandai in 1992. It was officially licensed by Nintendo. The system sits on top of the Famicom unit itself and features a cartridge slot and a barcode reader. The cartridges did not work with the Famicom without the Datach system being attached since they were about half the size of regular games. It came packaged with the game Dragon Ball Z: Gekitō Tenkaichi Budokai though other games were released. In total 7 games were made for Datach. 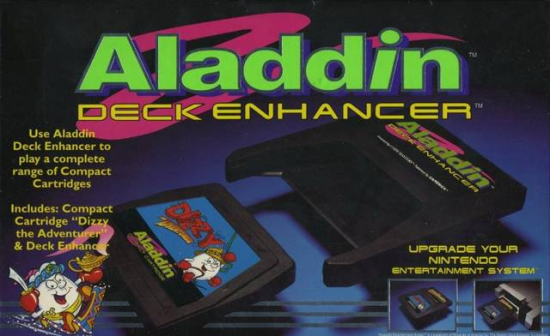 Developed by Camerica and Codemasters, the Aladdin Deck Enhancer was an add on for the NES which was very similar to the Famicom Datach system. 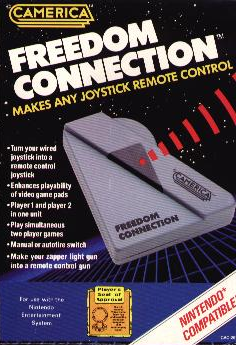 Another peripheral from Camerica, the Freedom Connection was released in 1986. It allowed you to plug one controller into it. This then transmitted to the receiver, which was connected into the main console. Essentially, it let you sit further away from the television! 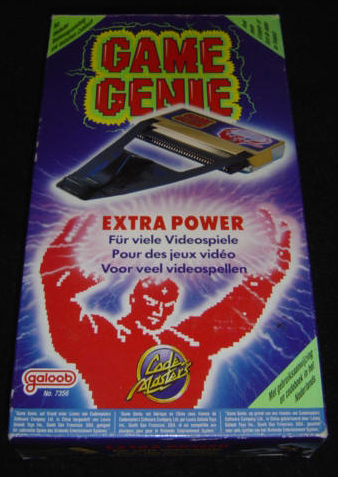 The Game Genie was a popular cheat system which was produced by Codemasters and sold through Galoob. It allows the user to enter cheat codes for their games in order to change the way the game is played. Common cheats included extra lives, invincibility and extra energy. The user simply has to insert the Game Genie like a regular cartridge and then insert the game they want to play into that. Due to the way the top loading NES was designed, using the game genie meant that the drawer could not be shut over. It is known to have bent the pins within the NES because of this. 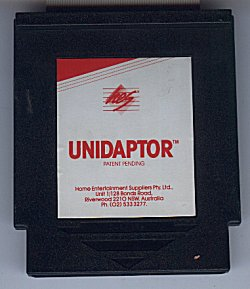 An adaptor which let PAL NES owners (Europe) play North American games. This game converter apparently lets you play North America, PAL and Japanese NES games. 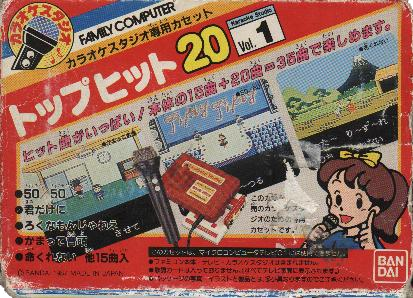 Released for the Famicom by Bandai, the Karaoke Studio was a Karaoke add on which came with a microphone and an adaptor. The adaptor worked in the same way as the Datach system and let you play custom cartridges through it. 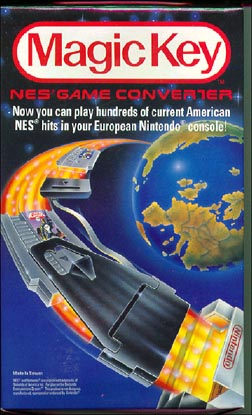 Another converter which lets Europeans play North American NES games. The Miracle Piano was a musical keyboard which worked with the NES. 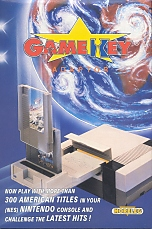 It was developed by The Software Toolworks and released on several platforms including the SNES, Amiga and Sega Genesis. The keyboard came packaged with a foot pedal as well. When the user plugged the cartridge into the NES, they could learn the piano using the keyboard by following the on screen notes. There various games included were designed to test the user and help them progress. The Teleplay Modem was an interesting accessory which never really took off. It allowed users to play online with other NES owners however it was also created to let users play with Genesis and Super Nes. Both Nintendo and Sega refused to license the modem or the games which were developed for it so it never really took off.